HANDS DOWN! The fastest, most reliable 5′ x 10′ flatbed printer on the market…at a price that won’t break the bank! 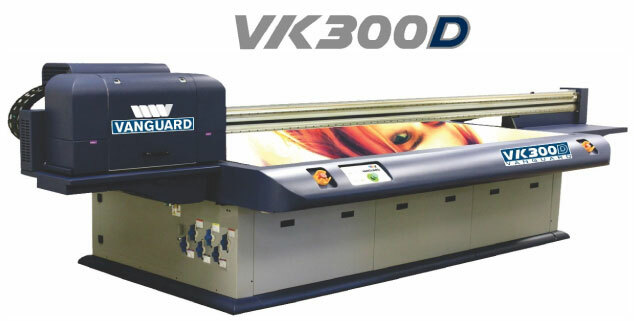 If you own a sign shop, commercial printing business, manufacturing company, architectural firm or any other company where performance and quality are a necessity… Than the VK300D is the perfect printer for you! With a configurable carriage design, from 2 – 10 printheads, you can start at the production speeds you need and easily add printheads as your demand grows. All without the headaches of having to replace a printer you have outgrown with another solution. More importantly adding more printheads doesn’t bust the budget like a new printer would. With just 2 color printheads you can print 15 boards an hour in production mode. Add 2 more and reach 25 boards an hour, 4 more will get you 40 boards per hour at a quality that will satisfy the most demanding customer.